Happy Friday everyone! This blogiversary week ain’t over yet, there’s TWO more giveaways for you guys! You’re not gonna want to miss tomorrow’s either, trust me! If you missed them, make sure you enter the giveaways still going on from day one, two, three, and four! 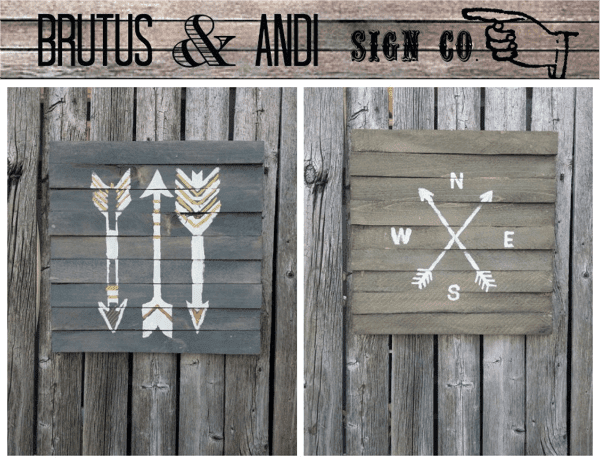 Today’s giveaway is brought to you by the Brutus and Andi Sign Co! 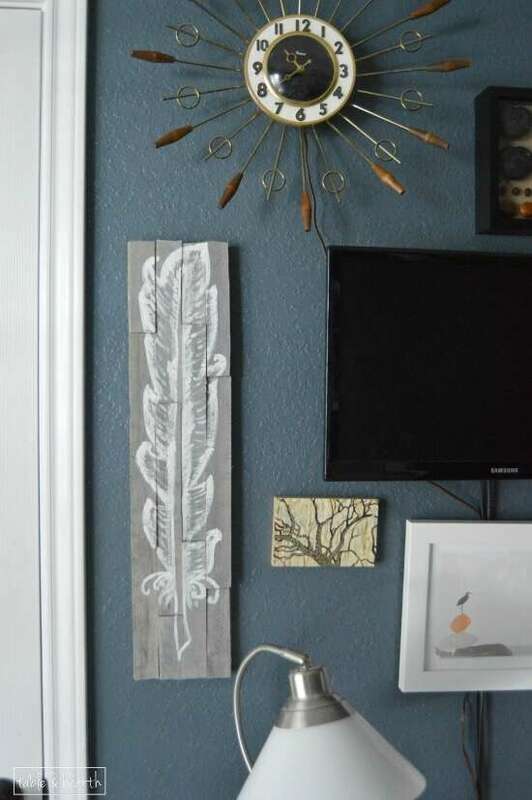 Stacey from Addison Meadows Lane is one of my good bloggy friends and when I found out about her new Etsy shop, I fell in love with her Hand Painted Feather piece and ordered it right away. It was slated for our master bedroom but when I saw it, I knew it was the perfect size for an awkward space left on my office gallery wall. It looks amazing! The rustic wood ties in with our driftwood flooring, the white ties in with our daybed in the room, and we love to go birding so of course we love the feather on it, which makes it fit in with our Wooden Pencil Co. Texas state bird print too (which you can win your own of here!). Now’s your chance to win a Brutus and Andi Sign Co piece for yourself! They’re giving one lucky reader a $30 gift card to their shop! 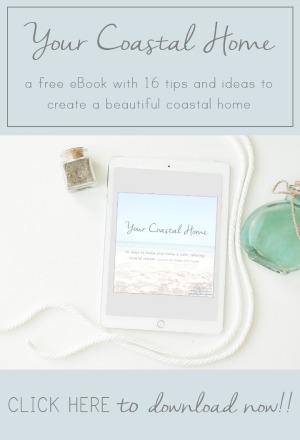 Enter via the Rafflecopter below! 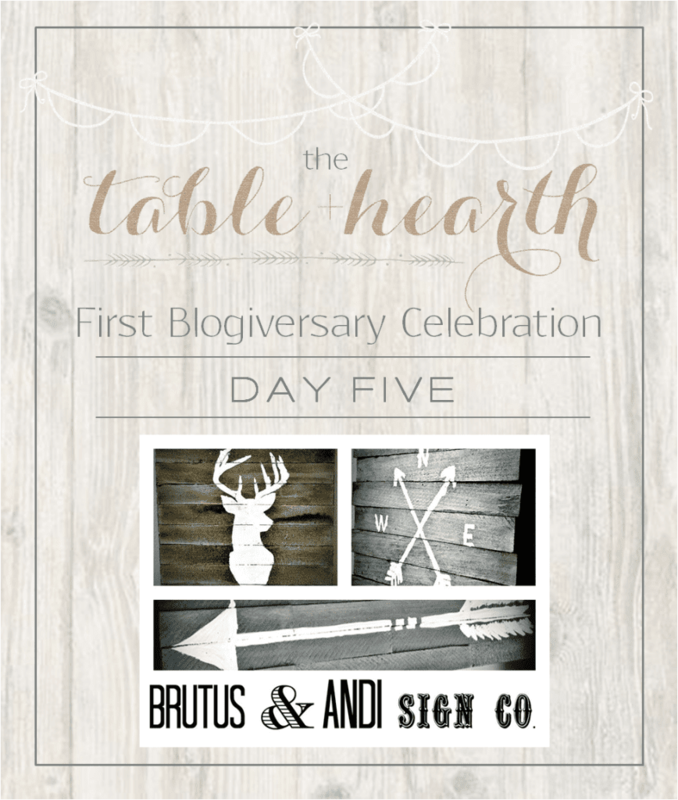 Giveaway Rules: The giveaway has been sponsored by Brutus & Andi Sign Co. and hosted by Table & Hearth. No purchase necessary. Giveaway ends at 05:00 AM CST on April 3, 2015. All entrants must provide a valid e-mail address and be 18 years old. The giveaway is open to residents of the United States and Canada only. One lucky winner will be randomly chosen from among the entrants within 48 hours and notified via e-mail. The winner has 48 hours to respond via e-mail to claim the prize or another winner will be selected. Winner will coordinate with Brutus and Andi Sign Co for gift card delivery. Shipping and handling charges not included. Family members of Table & Hearth or Brutus and Andi Sign Co. are not eligible to win. Odds of winning depend on the number of entrants. Please read the complete terms and conditions on the Rafflecopter form. 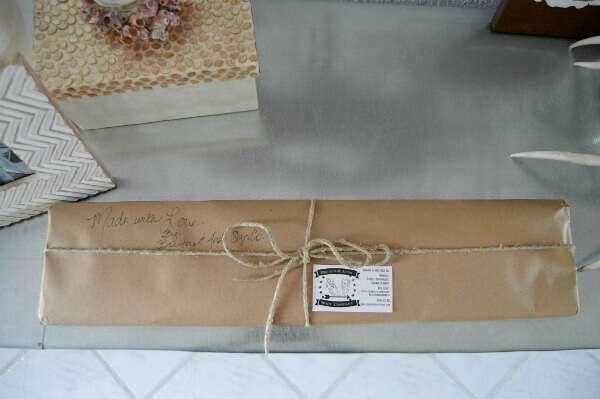 If you have any questions, please contact us at tableandhearthblog (at) gmail (dot) com before entering the giveaway. VOID WHERE PROHIBITED BY LAW. 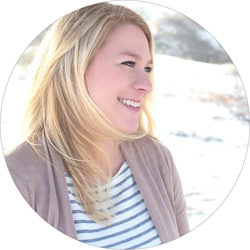 Thank you so much for the opportunity to be part of your Blogiversarry! I just love seeing what our creations look like in peoples homes. 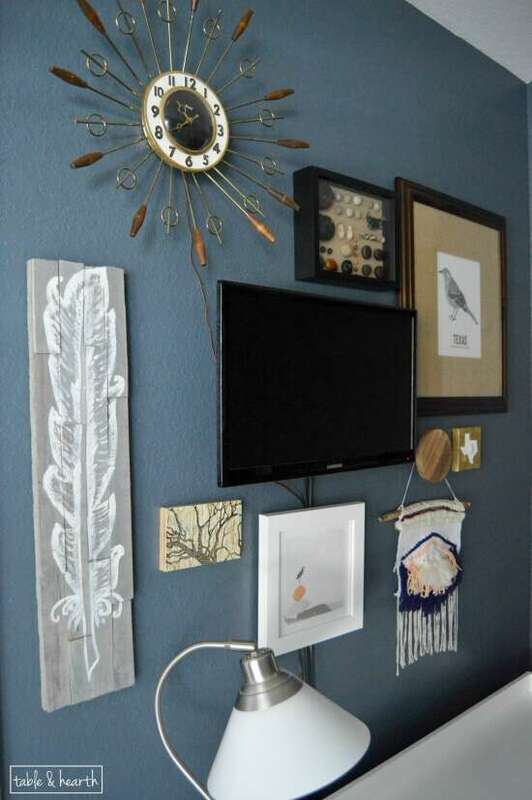 Your gallery wall is gorgeous! I would definitely choose the 317 Indiana sign! I thought about one of those for our area code too! Cute! If I was the lucky winner, I would pick the Palm Tree and Moon sign. These are all very cool! Most definitely choose the Stag Head. Wonderful pieces! Love to choose one with my area code. Love these signs. I love those Alina :) Thanks! I would pick the Indiana 317 sign! It’s awesome! I love artwork for your home state, obviously ;) Thanks Amy! That one’s a huge hit, love it too! Thanks Katelyn! So many choices ah! I think I would go with the compass or feathers! I know, right?! Thanks Bre! I like the blue anchor!! Hard to choose, they’re all beautiful! But I think I’d go with the sign with the palm tree and moon. I love Stacey’s shop! 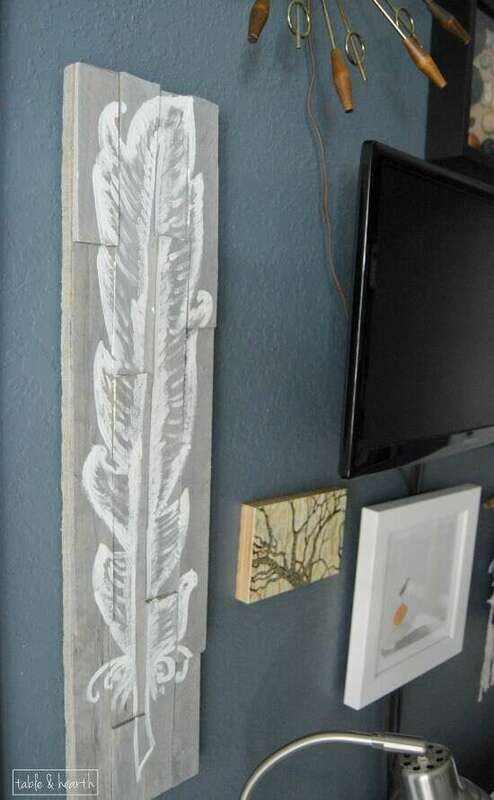 The feather looks great on your gallery wall. I would pick between the NSEW arrows, the stag head or the adorable pineapple. Aaaaah! I can’t choose! Ah yes, the adorable pineapple! Good luck Sarah! I have no idea how I would choose – I want them ALL! There are so many good ones aren’t there?!? Thanks Vicki! I would love to have the painted arrow. The arrow is a symbol in my boyfriend and I’s relationship. Love it Colleen, I wish you luck!! I love the Stag Head. Prob the stag head! Congrats!! I love these types of signs! I would get the state and area code in one of the handmade signs! So cute. Good luck Megan! i would choose the State and area code sign!!! I would get the state sign with area code! So cute! 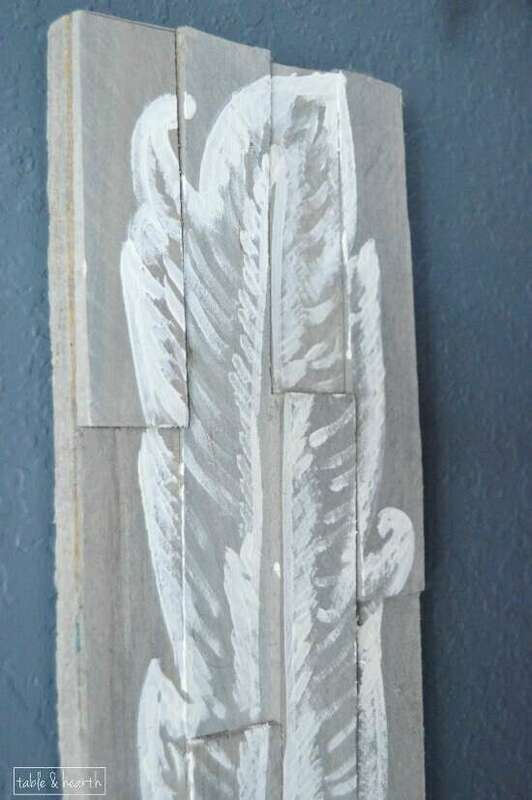 I really love the wooden hand painted feather sign! It would look great in our bedroom(: Thanks!